Picked up for TV by Hivemind after a multi-studio bidding war with long-time producing partners Sean Daniel and Jason Brown, Bad Robot veteran Kathy Lingg, and former Valiant Entertainment CEO & Chief Creative Officer Dinesh Shamdasani. From the bestselling creative team behind Old Man Logan and Green Arrow comes a character-driven meditation on obsession, mental illness, and faith. The legend of the Black Barn-an otherworldly building alleged to have appeared and reappeared throughout history, bringing death and madness in its wake-ensnares and entwines the lives of two very different men. Plus, this collection includes a variant cover gallery from some of comics' best artists, including CLIFF CHIANG (PAPER GIRLS), JOCK (WYTCHES), SKOTTIE YOUNG (I HATE FAIRYLAND), and more! 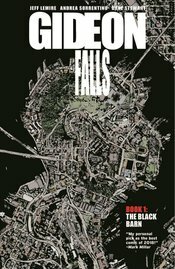 Collects GIDEON FALLS #1-6.